A few weeks back Ian and I headed out to have a look at the Karting tracks north of Dinan. We went to the track which is advertised as being in St. Malo http://www.karting-saint-malo.com/ but is in fact quite a way outside on the way to Cancale. The track looked good and well kept the atmosphere seemed friendly. 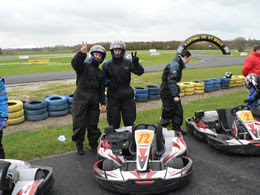 It was outdoor and had two different types of go-kart that you could hire; a 9 HP(50mph) and a 22HP (70mph). These types of kart are limited to kids over 12 years of age. For under 12's there are mini quads and mini karts and a training circuit but it is very slow. If you have kids over 7 it's better to go to the outdoor karting at Le Meziere near Rennes http://www.royalkart.com/ (cheaper than the indoor one at Cap Malo on the opposite side of the motorway). The St. Malo karting also does Quad hikes which look like fun and not too costly at 2 hours across all types of terrain for 2 hours 65 euros. Later that afternoon we went to find the karting in Dinard which was not a scratch on the one at St. Malo but a lot closer to get to for a quick whizz round we thought. However, on closer inspection it transpired that the karts were electric and the kids karts were fixed to go at nearly walking pace which took the fun out of it for them. I don't think it was the best choice. Both had more or less the same tariffs (approx) 15 euros for 10 minutes.